Okay, so I know you can’t judge a book by its cover, but before launching into an assessment of the novel per se, let’s pause to admire the artistry that went into designing the cover of this paperback original. 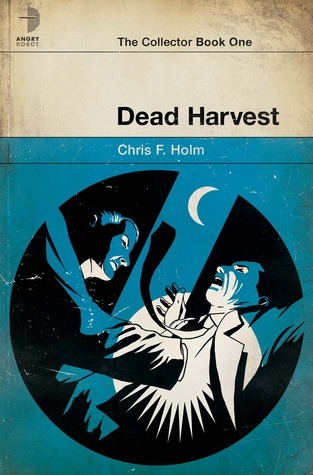 Angry Robot has been publishing quite a number of interesting novels lately and they’ve all had great covers, but they outdid themselves with the jacket for Chris F. Holm’s Dead Harvest. The stark blue and white vintage look works very nicely on its own, but they’ve gone one step further by making the cover look smudged and time-worn. That’s awesome. That said, the novel housed within very nearly lives up to the pure aesthetic joy of the cover. Almost, but not quite. To be clear, Dead Harvest is a fast fun read with plenty of lively action sequences. Imagine a bodiless Jack Reacher finding himself in a cross-over episode between Joss Whedon’s Angel and the old comedy-drama series Dead Like Me. For fans of hard-boiled supernatural fiction like that of Jim Butcher and company, this is definitely one of the better books you’ll read this year. Holm’s full-length debut, the first in his series of Collector novels, introduces us to Sam Thornton, an eternally-damned yet still-ethical soul collector. This book is a thrill ride and I enjoyed it immensely, but there’s a “but” and I’ll get to that in a minute. Doomed to do the dirty work of collecting souls of the damned for his mysterious and angelically mesmerizing overseer Lilith, our hero Sam finds himself on the run after he’s sent to collect the soul of a young murderess and fails in his mission because touching her pure soul convinces him there’s been some terrible mistake in the bureaucratic offices of the great beyond. Either that, or it’s a frame up job and whoever’s pulling the strings is trying to cause the end of the world by having an innocent soul sent to hell. The smart money’s on the latter as demons and angels alike start cranking up the pressure on Sam to comply with his orders. Or else. By the way, the thuggish angels are an especially wonderful touch here. Other than his hard-boiled attitude and his impeccable morals, Sam’s best weapon is his ability to shift around and inhabit bodies of the recently deceased, or crowd into and commandeer the body of a living person. Unfortunately, one of the ringers the powers that be send in to clean up Sam’s mess has this same ability. I know, this sounds confusing, but it’s actually great fun in the novel. And to Holm’s credit, the reader never gets lost during all this body jumping. But – ah, you knew that was coming – for all the shoot-’em-ups and narrow escapes from certain doom, Dead Harvest seems to lack moral weight. Perhaps this is a quibble to ask for ethical substance from an “entertainment” but I don’t think so, especially since we’re asked to imagine we’re on the front lines of an epic war between good and evil. The quasi-Christian mythology seems somewhere on the spectrum between Milton’s Paradise Lost and Whedon’s Buffy universe, but Dead Harvest never pauses the shoot outs and chase sequences long enough to give all this action the ethical dimensions that would make this novel live up to its titular allusion to Dashiell Hammett’s Red Harvest. Hammett never wrote about angels and demons, but he wrote about real moral dilemmas. Of course I do want more. Can’t wait for The Wrong Goodbye. I expect these adventures will get better and better.